It’s simple to add ZipBooks functionality to Slack. 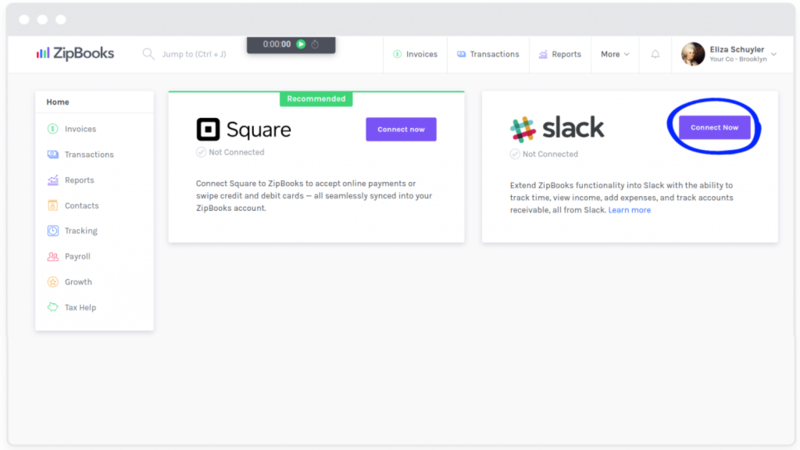 Simply head to your Account Settings, then Integrations inside ZipBooks and click “Connect” on the Slack integration panel. After you connect Slack to ZipBooks, enter /zb-login by your ZipBooks email and password, separated by spaces. Once you run this command, we associate your Slack user with your ZipBooks user so you have the necessary permissions to run the other commands in Slack. /zb-income will display a basic income statement including revenue, expenses, and net income. By default, this command will return data for the last 30 days. Optionally, add a month to get an income statement for a particular month. With these commands, you can start, stop, and check the status of time logs in ZipBooks. /zb-who-owes-me will return a list of your clients with unpaid invoices, and the amount they owe your business. You can use our slack integration with any plan, including the free starter! See our slack integration in the Slack App Store.